Father Thomas Betz, O.F.M. Cap., is an immigration expert with long ties to the Philadelphia Archdiocese. In this interview with CatholicPhilly.com, Father Betz discusses the issue of refugees and migrants in the United States, especially those people who are not lawfully residing in this country. 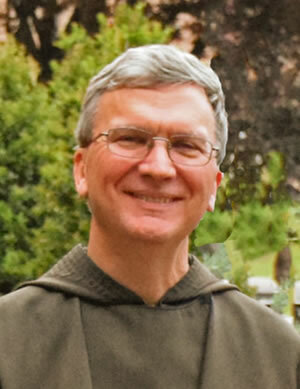 Currently the provincial minister for the Capuchin Friars’ Province of St. Augustine based in Pittsburgh, Father Betz served in the archdiocese for years as pastor of Holy Redeemer Chinese Catholic Church, coordinator for the Chinese Apostolate in the archdiocese, director of the archdiocesan Office for Pastoral Care of Migrants and Refugees, and as vocation director for his order. Born in New Castle, Pa., he holds a law degree from the University of Pittsburgh. After practicing law for four years he entered the Capuchin Fathers and was ordained in 1991. Among his writings is a paper, “Catholic Social Teaching on Immigrants and the Movement of Peoples,” which is posted on the website of the United States Conference of Catholic Bishops. Q. In your paper you addressed three basic principles in Catholic social teaching on immigration, the first being, “People have a right to migrate to sustain their lives and the lives of their families.” What does that mean? A. People have a right to live in safety, free from fear. People often leave their home country because they flee war or violence. People, including many Christians, leave their homes because they are persecuted, because of their religion or ethnic background. And people migrate in many cases, for example Mexico or Central America, because they cannot find what they need to live in dignity. Their countries cannot offer them jobs to allow them to care for themselves or their families. Many people cannot find work which pays enough to allow them to educate their children. They can’t buy a home that is suitable for raising a family. It is better to come to the United States and work for very low wages so that they can send money back to give their family a decent life. The resources of the earth are from God and they do not belong to any one people. They belong equally to all of God’s children. People have a right to the basics of life. If a person’s country cannot provide any way to live or support a family, people will go somewhere else. If we are honest, we must say that we too would do whatever is necessary to support our families, including move to a different country, with or without legal papers. Q. Your second principle was, “A country has a right to maintain its borders and control immigration.” In your view what should the United States be doing to achieve this? A. It is important to say that people who enforce immigration laws are not villains. They are not the enemy. Our country has a right, even a duty, to have and enforce immigration controls. We should respect and even appreciate those work for the immigration enforcement agency. But we need to ask what should be the right policy. It is not fair to say that enforcing immigration laws is immoral because it is not true. The question brings up the third principle, “A country must regulate its borders with justice and mercy.” The people who work for the immigration enforcement service do an important work, but we as a nation need to have merciful laws for them to enforce. Given that the resources of the world are from God and for all of his children, we need to control our borders with mercy, with a concern for the needs of all the people of the earth, not just the people of our country. We should also remember that immigration is overall good and that having a well-ordered immigration system is in our best interest because immigrants enrich us. We need to do what is good for those who wish to migrate, but also what is good for our country. If we had absolutely open borders, there would be chaos; it would wreck our own country and that is not good for anyone. But still, God asks us to be compassionate to people who are really poor and can’t maintain themselves. The Gospel tells us that we cannot stand by while others suffer. So a merciful immigration policy would ask us to accept as many needy people as possible without harming our own country. Q. It seems to me we have departed from our founding principles; we used to welcome all comers. Now it seems legal immigration is mostly limited to people with high education or special skills or relatives of people already here. Can you comment? A. Yes, and that is against Catholic social teaching as well as our founding principles. We Americans used to see ourselves and our nation as a refuge for people who needed a decent place to live but didn’t have it. Our early history is the story of people who left England fleeing religious persecution and yearning for freedom. The Statue of Liberty is a symbol of our open welcome to the poor and oppressed people of the world who long for a new life of equality and opportunity in America. During the years of the largest migration of newcomers to America, the largest migration relative to the population of the country, roughly from the mid 1800s to the early 1900s, we used to have a great need for unskilled labor and virtually everyone who came was welcomed. Today our immigration system favors people with education and high skills. They can get visas to come legally and we pay them a dignified wage and all benefits. But we also need lower skill, lower wage workers — farm workers, restaurant workers, landscapers. For these lower paying jobs we don’t provide enough visas. The jobs are here. Americans cannot or will not fill these positions. People in Mexico and elsewhere are desperate for work to care for their families. But we don’t offer visas so that these workers can come legally and live a dignified life here. The people who come in for these jobs would rather come with a visa, but they can’t get one. If we provided the opportunity for these workers to apply for visas they would come with the full protection of the law, but we don’t seem to want to do that. The system creates unfairness. Q. If there were no penalties for coming without a visa, wouldn’t we be inundated because of the sheer number who want to come to the U.S.? A. If there were no barriers to entry, we would collapse. We need immigration control. But if we provided more visas for low-wage, low-skill workers, it would be much better. There are jobs here that need to be filled. Some employers might not like it if we had an immigration system that provided visas and work place protections because they would then have to pay taxes and benefits, but it would be a better system. During the last days of the administration of (President) George W. Bush there was a proposal to do this, but his own party shot it down. Q. There is a lot of talk about the rights of immigrants. What about the duties of immigrants? What should we expect of them? A. Immigrants should obey the law like everyone else. But it is not just to see illegal immigration only as a matter of right and wrong, of law keeping and law breaking. After all, God condemned the rich man who lived in luxury while the poor man, Lazarus, starved at his door. When we have no concern for the poor who live in the countries nearby but want to keep all of our wealth for ourselves, we are like the rich man in the Gospel. Jesus had harsh words for him. Illegal immigration is bad for America and it is very bad for the migrants who come without legal status. They live hard lives, often exploited. They may be able to send some much-needed money home to their children and families, but they live in great hardship. Some say they should get in line like everyone else but in fact there is no line. That’s one of the great myths about immigration; that undocumented immigrants could come legally if they wanted to. Immigrants have a duty to pay taxes, but often undocumented persons can’t. Most would pay gladly, but they cannot reveal themselves. Q. Is it unreasonable for us to expect them to learn English, the language of our government? A. I think people who come as adults have difficulty in learning English, but their children and grandchildren speak it well. Since the beginning of our country immigrants have struggled with English. This was true of our European ancestors and it is true today. But the children of immigrants want to speak English. We should rather be concerned that they can’t speak the language of their parents. It would be better if they were bilingual. But usually English wins and the language of their parents is lost. Q. Should we expect people who come with a green card to eventually seek citizenship? A. For the most part they want citizenship. Citizenship enables them to sponsor their relatives to come to the United States. Q. What are your particular concerns? A. As a Christian and an American my greatest concern is for kids who were brought here very young and raised here. President Obama signed the DACA (Deferred Action for Child Arrivals) executive order. It didn’t and couldn’t give them full legal status. It only says that the law would not be enforced in their case. The president had the right to set law enforcement priorities and every president does this. President Trump has not revoked DACA and he says that he is sympathetic to their situation. Most Americans think they should be allowed to stay. These young people have lived in our country since childhood and they are part of our society. For the most part, they are educated high achievers and we want them here. In the case of children of immigrants who are born here and are citizens but their parents are not, we should not break up the family. For the past 20 years the law has not been enforced against them. Do we really want to send these parents of us citizens away and leave their children in foster care? That is not in our best interests. Another thing, for years the Immigration Service has had a rule that they would not enforce the law at churches, schools and health care facilities. The immigration officials are not allowed to raid religious services, schools and hospitals. People ought to be able to worship God or go for essential services without the fear of an immigration raid. Obviously in serious criminal matters the law must be enforced everywhere. Refugees are another issue. They live in danger and absolute misery. Decent people cannot turn away from their suffering. The best solution is that their country become peaceful so that they can stay there, and the second best is that they relocate to a nearby country. If we are followers of Jesus, we can’t say we don’t want to be involved. We can’t turn our back on refugees. We must work with the rest of the world to find a solution. It is our problem if we are people of God. So good to read a balanced approach to this issue and also the comment that speaks so sanely to another aspect of the problem. Thank you for taking the time to keep us informed and with such knowledgeable people. Father Betz presents a reasoned approach to the issues of immigration and refugees. Not discussed by him is the natural resource situation in countries that generate illegal immigrants that arrive in the U.S. Now I have read that Honduras is a country with abundant natural resources. Mexico I’ve read has large untapped petroleum resources. Also corruption and bribery seem to be endemic to some Central American countries. I’ve read a few statements by bishops and clergy from Central America concerning the shortcomings of their governmental systems and the existence of organized crime syndicates there. So it seems the problems of immigration and refugees need to be addressed both at the “sending” end and the “receiving” end. President Trump has taken a higher profile on addressing illegal drug smuggling into the U.S. than any other President. What;s wrong with that? Similar to land property usage issues in granting an “easement by use”, perhaps illegal immigrants who have been in the U.S. for ten years or more should be granted “legalization by use” and then apply for citizenship. While there may be no “line” for people waiting to get into the U.S., there is some existing system or quota the U.S. government uses that represents the will of the Congress and the law. It is up to the Congress and the President to modify it.